Adding movement to your slides through the use of animation or slide transition effects is risky. Movement distracts the audience from your message. Here are suggested approaches for using animation and slide transitions in a professional presentation. A number of organizations have “banned” animation and animation has a poor reputation amongst many presenters and audiences. Why has this happened? Because too often presenters use fancy animation effects like twirling, flying, or bouncing in an effort to “keep the audience paying attention”. These effects do not keep the audience paying attention, they annoy and distract the audience. Is animation ever appropriate? Yes. It is useful when you want to build the different parts of a slide in order to focus the audience as you explain your point. Instead of having all of the elements appear on the slide at the start, you build each piece as you speak about it so you can give context before they come to a conclusion. Use only simple animation effects, such as Appear, Fade, Dissolve, and Wipe instead of the crazy motion effects. This way the effect does not distract from the message you are delivering. The only slide transition I suggest you consider is a quick (0.5 second) Fade between slides if you want to have something other than a quick appearance of the next slide. It is subtle and does not distract the audience. 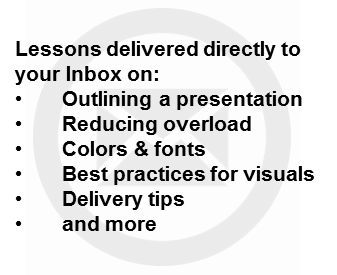 Every element of your presentation, including the use of animation or slide transition effects should be tested to make sure they add to your message, not detract from it. Keep this in mind when you consider the use of animation or slide transitions in your presentation. When you add animation effects or slide transitions, you will have to press the "advance" key far more often on the keyboard as you present. This ties you to standing beside your laptop and having your finger over the keyboard almost all the time. So you don't have to stand beside your computer to advance each build on the slide, use this remote, the one I have relied on for over a decade. Once you start using a presentation remote you will hard pressed to go back to the keyboard again.